Glenn Highway is one of three National Scenic Byways in Alaska receiving this honored in June 2002. The designated 135-mile segment starts in Anchorage at Milepost 0, and ends near the border of the Matanuska-Susitna Borough in the area of Gun Sight Mountain. 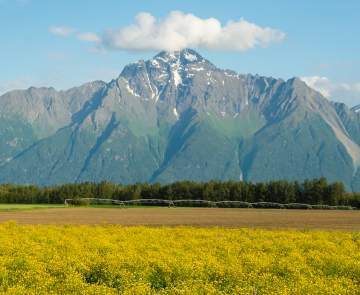 The Mat-Su Valley and the Glenn Highway Scenic Byway are noted for the braided Matanuska River basin, rich cultural history, plentiful wildlife, access to outdoor recreation, and fertile soils that reap gigantic vegetables. Stop by the Mat-Su Visitors Center to pick-up a complimentary map that highlights points of interest along this national byway as well as an audio CD. Leaving Anchorage north on the Glenn Highway, visitors travel around Cook Inlet, with spectacular views of the Chugach Mountains, including Pioneer Peak, an iconic mountain. Off the Old Glenn Highway, Knik Glacier looms, with tours available via helicopter and jet boats. The highway goes across the Palmer Hay Flats, which is a haven for migratory birds, moose and other wildlife. After passing through Palmer, the highway meanders along the Matanuska River, passing through the historic communities of Sutton and Chickaloon. Stop at the Alpine Historical Park to learn about the area&apos;s coal mining past. Continuing north, Matanuska Glacier comes into view, with photographic opportunities at nearly every turn in the road. 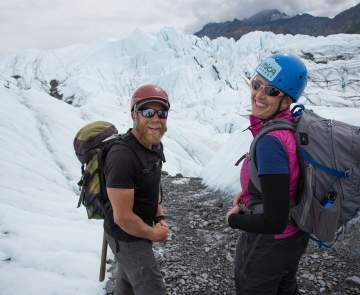 Matanuska Glacier State Recreation Area is at Mile 101, where visitors can walk on Alaska&apos;s largest road-accessible glacier. Guided hikes are recommended for the full experience. Several companies offer rafting trips, ice trekking and even zip lining near the recreation area. Overnight accommodations are available at some of the historic roadhouses that line the highway in the area, including Sheep Mountain Lodge, Majestic Valley Wilderness Lodge and Eureka Lodge. The Glenn Highway continues north to the town of Glennallen at Mile 189, just outside of the borders of the Mat-Su Borough. The scenic beauty and outdoor activities that line the highway from Anchorage to Glennallen make it one of Alaska&apos;s best road trips - come for the afternoon or stay for the weekend.